G-Cloud 7 has been created and designed to encourage more open markets and to allow the public sector to buy what it needs via the Digital Marketplace. The Digital Marketplace is the online platform that all public sector organisations can use to find and buy cloud-based services (eg web hosting or site analytics). This allows us to build world-class digital services. 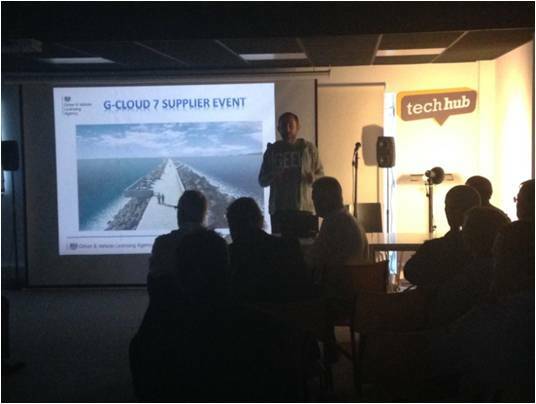 We held the event to share the latest information on G-Cloud 7 and encouraged local small medium enterprises (SMEs) to consider getting onto the framework. The deadline for G-Cloud 7 registration was 6 October. 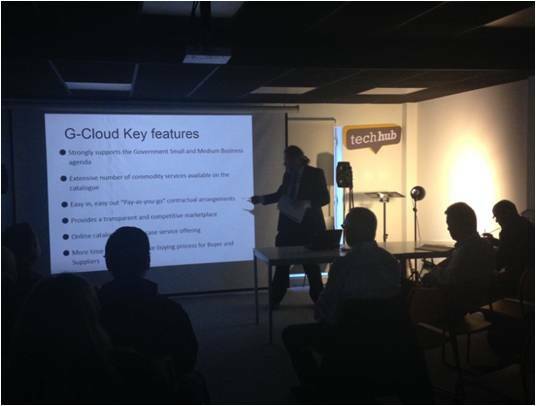 We showed our local SME community how to register for the G-Cloud 7 framework and timed the event to coincide with our exit of our Partners Achieving Change Together (PACT) IT contract less than a week previously. Currently there are only 13 Welsh based SME businesses within the G-Cloud 6 framework. As the TechHub partnership is designed to contribute to and help grow local talent and local business start-ups it seemed very appropriate that their offices situated on Wind Street in Swansea would be used for this event. Paul Harwood one of TechHub’s directors opened the event and thanked the delegates for their support (41 SMEs in a room to hold 45 max – so great buy in from the market!) Paul stressed how important it is that local talent/businesses are now able to work with large government organisations such as DVLA. Mark Evans, DVLA’s Chief Enterprise Architect and Dave Walsh, DVLA’s Head of IT Commercials, spoke about our commitment to further develop our digital channels to build future IT services. We need to attract the right talent to create a dynamic and challenging digitally capable organisation. This allows us to contribute fully to the development of a local technology community. The scale of our recent exit from the PACT contract and also the scale of the DVLA’s current spend within the G-Cloud framework was also outlined. This prompted more than a few delegates to sit up as the potential opportunity to grow their businesses became very clear. Steven Lewis’s (CCS G-Cloud framework manager) presentation gave an opportunity for the delegates to learn as much as possible about the framework, and the process involved within the tender period. This would give them the best opportunity of succeeding in becoming a supplier. Steven explained the actual tender process thoroughly, along with the buying process used by government organisations to identify suppliers to potentially contract with. As anticipated there was plenty of interaction between the presenter and the delegates at this point... after all, this is what they had travelled here to find out. Nigel Wallis, Ergon Ltd, is a current contractor to DVLA, having successfully contracted as an SME via a previous development of G-Cloud. Nigel spoke about his experiences of putting his company’s offerings on the framework as well as some invaluable hints and tips to maximise chances to successfully win government contracts. He created quite the discussion amongst the group, and Nigel was very keen to share his clear views. Caroline Demoulpied, Welsh Government Sell2Wales spoke next. Sell2Wales is an information source and procurement portal set up to help businesses win contracts, promote their services and find contract opportunities. Sell2Wales also helps public sector buyers to advertise and manage tender opportunities. She presented an alternative way to contract with government. (we’ve recently worked together with the Welsh Government at their digital Tuesday events where the theme of local SME talent supplying government contracts has also been discussed and promoted). After the presentations, delegates were given the chance to have an interactive networking session on the DVLA floor of the TechHub offices. This gave everyone the chance to have one to one discussions with all presenters/delegates/DVLA representatives. The majority of delegates took part in this session. As everyone was leaving a few SME representatives were already discussing their battle plans in preparing to bid for their inclusion on the G-Cloud 7 framework. This was really good to hear.